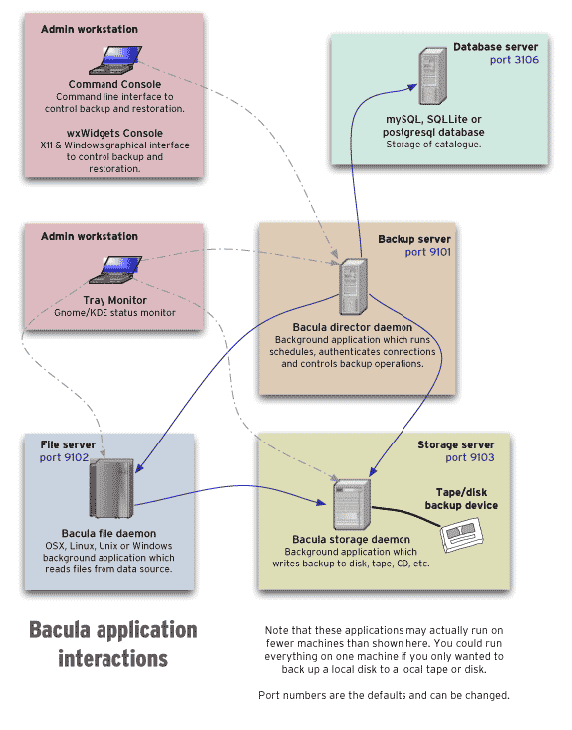 Bacula is a backup system that Wikimedia has been using since 2013. The switch to Bacula bypassed some of the problems with previous Amanda setup, including disk space problems on its host (tridge). In 20130610 ops meeting it was proposed that the NFS/iSCSI shares on the Netapps could be used to solve the problem stated above but it was quickly pointed out that both NFS and iSCSI communications are unencrypted. At the same time there are possible concerns with the state of the backups being unencrypted on the end disks as well. We could use encrypting file systems either at block level (iSCSI) or filesystem level (eCryptFS) to solve the problems above. However that would cause problems like encryption key handling, leak of information (filesystem names in ecryptfs case) and the possible loss of all encrypted data due to the SPOF that the backup server is all of which given the specific problem in hand could be avoided. Given all that I proposed that we use bacula who has inherent encryption both for communications and storage, no information leaking and the capability for a master key allowing decryption of encrypted data. There is one Director Daemon only. There is going to be one File Daemon (or FD for short) per machine to be backed-up. All communications (indicated by arrows in the PNG) can be encrypted. There are passwords that authenticate each party to all the others. TLS/SSL can be used in addition. The data store can be Tapes, Files, DVDs, Diskettes. All are called Volumes. The specifics of each medium is abstracted by bacula in day to day operations. The SQL server stores the catalog. It is used as the fist place where information should be sought when needed. However it is not the primary source of information. This resides depending on case in the Volumes, configuration files and bootstrap files . Below i try to explain the various concepts of bacula very quickly. Since jobs have way too many attributes that can be defined, jodefs (short for job defaults) work as a way of storing all the standard attributes that don't change between jobs and that keep job definitions short. Volumes is what the data get's stored in. Mostly an abstraction layer for hiding device specific behaviour from the other components. It can be tapes or files it can also be DVDs, diskettes or even FIFOs. Volumes have unique IDs called labels. A volume can be labelled either manually or preferably automatically either through an autochanger (in the case of Tape libraries) or internally by bacula. Control channels. All paths in the architecture diagram starting starting from the Director or going to the Director are control channels. The main reason these should be encrypted is to avoid leak of the username/password used by the director to authenticate itself to the other daemons, since if these leak, impersonation of the director becomes possible (and relatively easy). Also control channels carry client's (backed-up server) file metadata and that should be protected as well. Furthermore File Daemon can be configured to send their data encrypted to the Storage Daemon. In that case the actual data never leaves the client unencrypted and is stored encrypted at the end medium (Tape, Disk, DVD or diskette). In this case the data path could be already considered encrypted so another layer of encryption at the communications layer is quite possible unnecessary (TODO: confirm this). The data is encrypted using the private key of an SSL certificate and can only be decrypted with that key or a Master key. The director. Indeed a SPOF. No multiple directors are allowed at this point and the hostname is the username in control channels. Failure of the director will cause all backups and restore to not be possible. Reinstalling a new director is however relatively easy. The catalog. A standard MySQL server. We could have a hot-standby slave to avoid a SPOF. Backups running during failover will fail. The storage daemon. Multiple storage daemons can exist albeit they do different jobs. The failure of a storage daemon will lead to all backups and restores associated with that daemon to fail. The same problem with the director regarding the hostname/password scheme exists. Reinstalling a new storage is however relatively easy. The data store. NAS, Tape Library, DVD/CD burner etc. A major SPOF from a hardware perspective. Bacula can not do anything about it. But since we will rely on Netapps for the data store we will use their HA. A proposed solution is to use a server in EQIAD as a director and storage daemon. Then we allocate and NFS export one or more Volumes from the Netapps for the data backend. The fact that the data will already be encrypted before even reaching the storage daemon means that we should have no problem with the unencrypted NFS channel. Plus we won't need to ever wipe at least those specific disks in the Netapp. The clients should also use encrypted control channel for communication with the director daemon and the storage daemon. Since everything will be encrypted on the data channel we should avoid double encrypting it. Off-site backups are created by using Netapp's snapmirror for sending data to the other DC easily. We already have the snapmirror license and this solution works. Filesystems at the backup Netapp are read-only. For now just mirror the already in place backup. Revisit the issue later, probably on a case by case basis? While before it used to be integrated with bacula, this created issues on performance and concurrency when the sizes grew. Since 2018, a separate system is used that still eventually uses bacula for long term backups, but otherwise is separate for backup generations, provisioning and snapshoting: MariaDB/Backups. The old bacula integration is still available if needed, and at least analytics is using it for internal dbs. Everything must be done via puppet. There is a puppet module for this and role classes for director and storage daemon. Generally nothing. Occasionally we 've seen the following problem: The size of the backups would increase enough to throw the schedule out of plan, which means no immediately writeable volumes are around getting all backups paused while waiting for a volume to be allowed to be recycled. Judging whether this is a one time incident or a change in the schedule is required is a bit difficult, it requires knowing history a bit. In any case, the issue can be fix temporarily by purging the oldest volume around. use the "mark" command to mark files you want to be restored. wildcards work, there is also "unmark"
If you try to restore from a host that has already been decommissioned you can still select it as a source for restore but you will have to select a different host as the target. Doing that you will see on the target host that the file structure will be restored but all files are empty. On bconsole, using the "messages" command you can see what the issue was and you would expect a message "Error: Missing private key required to decrypt encrypted backup data.". Luckily, Bacula encrypts all files with 2 keys, the host key and a global master key, which also happens to be the Puppet CA public key. You can see this in the /etc/bacula/bacula-fd.conf on any host as PKI Master Key = "/var/lib/puppet/ssl/certs/ca.pem". ssh to the host you want to restore to and paste the data into a new file, "temp-restore.pem" (or any name). disable puppet with a reason, stop the service "bacula-fd"
Boot with your Rescue Live CDROM. This page was last edited on 14 March 2019, at 15:22.